Vicki Delany blogs as the One Woman Crime Wave — and boy, is she ever. She writes historicals, stand alones, a police procedural series, and several cozy series. 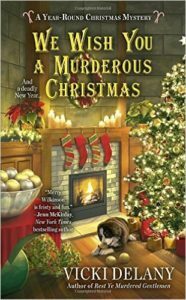 Her latest book, We Wish You a Murderous Christmas, launches today, November 1st, as this interview goes live. Can’t get enough of Vicki? Me either. Check out her website, her blog, her Facebook page, and, on Twitter, @vickidelany. In the interview, we talk about her Constable Molly Smith series, her cozy series, and her upcoming — March ’17 — Elementary, She Read, the start of a new Sherlock Holmes Bookshop Mystery series. One of Vicki’s great talents is the ability to shift genres; her cozies perfectly capture the form, while her stand-alones are the top of suspense and her procedurals envelope you in the investigation. Vicki also writes mysteries for reluctant adult readers, called Rapid Reads. I think this is a brilliant concept — short, easy-to-read and compelling stories for adults who, for whatever reason, struggle with reading. You can check out the latest, Haitian Graves, and find out more about the Rapid Reads series from the publisher. Laura Brennan: My guest today has been called “one of Canada’s most prolific and varied crime writers.” Canada nothing, Vicki Delany is one of the world’s most prolific and varied writers, with multiple series and stand-alones in a variety of genres, from cozies to historicals to police procedurals and thrillers. Vicki, thank you for joining me. Vicki Delany: Thank you very much, Laura, for talking to me. LB: There is so much to talk about, but let me start by saying how impressive your output is, not just because you can write across genres, but also because you started writing while a single parent holding a full-time job. LB: Tell me a little bit about those Sunday writing sessions. VD: Well, the Sunday writing sessions is a long way to go about producing a book. I mean, my first book took me four years. But my children were still living at home and they were still kids and, as you said, I had a full-time job. So I started out, a couple of hours on a Sunday afternoon was about the only time I could go to my writing. I also should mention that I took several writing classes which I think is a great way for a beginning writer to get started, not only because you’re being taught the tricks and the craft of the trade so to speak, but it requires you to do some work, particularly if there’s some expectation you’ll come to class next week with output. So anyway, I took some classes and I plugged along and it took me four years to write my first book and then my children grew up and I retired from my job at the bank and on it went. LB: I take so much dedication to write a book over the course of four years. Why were you driven to write a mystery? VD: I don’t know if driven is even so much the word. In my case, it was a little bit of the cart coming before the horse. Because my first idea was that I thought I might like writing for children, because I have three daughters. And one year at Christmas I wrote them a special story as the Christmas present, just a children’s story and it had their names as one of the characters and I printed it out and tied a pretty red ribbon around it. And I liked that, so I took a creative writing course at my local community college. And fairly quickly I decided that I didn’t want to write for children, but I was really enjoying the class. So I thought, gee, I wonder what I should write now? Well, I read mystery novels, so maybe I’ll try my hand at that. So actually, I turned writing mystery novels so I could stay in the creative writing class. LB: Your first novels were stand alone suspense novels. LB: Is that what you are reading at the time, is that your favorite? VD: Oh, yes, and in fact it probably still is my favorite. I wrote a couple of those at the beginning, then I switched to writing a police series, which is also a favorite writing style of mine. But I still like the real, good old-fashioned Mary Stewart, Barbara Michaels type of modern Gothic thriller. It still my favorite, for sure. LB: Well, what prompted you then to turn to the Constable Molly Smith series? VD: Partly it was the feeling with my publisher felt that maybe it was time for me to try a series. Generally speaking, a lot of mystery writers are encouraged to write a series because mystery readers like series. Which is certainly true, I enjoy series too. At the time I was working for a bank in downtown Toronto and one of my daughters lives in an absolutely charming little town called Nelson, BC, which is one of my favorite places in the world. And I thought well, if I was gonna write a book, I might as will set it someplace, metaphysically speaking, I wanted to be. So I came up with the idea of writing a series about a young policewoman in a small town which I called Trafalgar, British Columbia. LB: I enjoy the series very much, but I noticed that it’s marketed as the Molly Smith mystery series. But you don’t refer to it as that. You refer to them as the Smith and Winters series. VD: Partly because I wanted the, in the title, I didn’t want to call it the Smith and Winters series because that doesn’t tell you very much about what it is. Constable Molly Smith tells you that she’s a police officer, that she’s probably not an American police officer — in this case she’s Canadian. And the Constable Molly Smith and Sgt. John Winters series is just kind of a tiny bit of a mouthful, right? So I couldn’t do that. And I do consider her to be the protagonist of the series, although he is kind of the co-protagonist. In some books, he has almost as much, maybe even a little bit more screen time so to speak than she does. 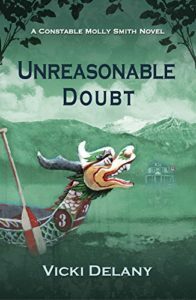 LB: And in the latest book in that series, Unreasonable Doubt, Molly’s mother actually plays an awfully big role as well. VD: Yes, and this is what I talk about sometimes when I’m asked about writing the police in the small town setting. That’s why I love a police series set in a small town or some kind of a small community so much. Because you really have the opportunity to bring other characters on board, the police, the friends, the family, the enemies of the police, in the way that people interact in a small town — which they really do, in real life. Whereas if you set, any series set in New York City or Vancouver or any kind of a big city, it’s pretty much a bit of a stretch of somebody keeps running into the same person on the street. But any of us who have lived in small towns know, it happens all the time. Plus people in small towns, particularly people who have lived there for a long, long time, know an awful lot of the secrets of the town. And the key to any mystery novel is the secrets. LB: The thing I really like about the small town setting for these mysteries is that, small-town settings have become synonymous with the cozy genre. But these are not cozy books at all. VD: No. No. They are not cozy, they’re not cozy in terms of mood or style or even, you know, some of the more dramatic and tragic things that go on. But they are cozy and the feeling of the small town, close, interknit community. For good and for ill. In one of the books in the series, Molly Smith is being stalked by a guy who’s out to get her and the fact that she is patrolling this one or two block area in the small town makes her easy, as opposed to a cop in a big city or particular somebody, you know, Highway Patrol officer or something like that, who covers a lot of distance. LB: Right. And the small town is used to really interesting effect in a genre that we’ve come to imagine usually is in a bigger, more urban setting, let’s put it that way. Police procedural genres tend to be in more urban settings. LB: So it gives it a really interesting, new fresh feel to it, to have it be set in a small town. VD: Great. Well, I’m glad you think so. LB: Yeah, I do. I like it very much. 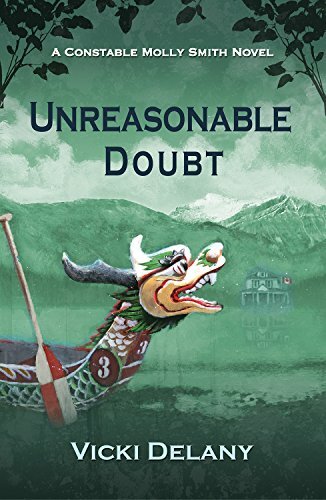 I don’t want to leave Unreasonable Doubt for a second, because I really enjoyed the book. So I don’t want to give any spoilers, but the central plot is, it’s about a man who goes back to his hometown after he’s been convicted of murder, 25 years later. LB: So, what was the inspiration for this particular story? VD: That is one example were somebody says, “Where do you get your ideas?” And I can trace exactly to where I was listening to a piece on the CBC radio, interviewing a man who had been to prison, I think in his case for eight years for murdering his wife. He was extremely well spoken, he was articulate, and he talked about, he’d lost his children’s childhood. And in his case it turned out his wife hadn’t been murdered by anybody, it has been an accidental death that the paramedics and then the coroner had missed. So a really tragic case. So this guy now works really hard for an organization that does work on behalf of what they believe to be the wrongly convicted. So was just listening to that guy story on the radio, and I thought, wow. That’s something that I would like to really explore. LB: Well, I’m curious as to why you explored it with Molly, as opposed to as a stand-alone. Because it feels like the story could have been either thing. VD: Yeah, it actually could have been. I don’t know that I even thought about that. I think that I just felt that it suited the small town setting once again. The things that we’ve talked about, all the people who know each other so well. Particularly in this case, he goes back to this town and even though what happened was 25 years ago, there’s a lot of people who remember. Some people are prepared to try to forgive him, and some are absolutely not. And Molly Smith’s mother’s memories of what happened at the time, although she isn’t involved, but peripherally she knows something that is able to lead the police to a conclusion of some sort. LB: So you also write — my gosh, you write everything! — but let’s talk about your historicals. How did you develop the Klondike Gold Rush series? VD: The Klondike Gold Rush series was actually one of the earliest things that I started. And then it sort of got put aside for a couple of years and then I went back to it. There are four books in the series. And those, I really like those. The history of the Klondike is absolutely fascinating. And it really was an amazing bunch of people in an amazing place at an amazing time. And some of the stories that come out of that are just, people larger-than-life, and unbelievable behavior and I just thought it was a great setting for what is in fact, it’s not a cozy, but it is a fairly light mystery series. It’s intended to be a little bit humorous and a little bit funny because I felt that the amazing cast of characters that I was pretty much given, historically speaking, I could do a lot with those. So I enjoyed those. LB: Are you planning to write anymore or is that series complete? VD:. That series is complete, now, yes, with the four books. LB: You are actually writing more books and one name can hold. LB: Why did you start writing under a pen name? You’re Eva Gates as well. VD: Yes. I’m Eva Gates for the Lighthouse Library cozy series for Penguin Random House. And that was actually a work for hire. I don’t know if any of your listeners know what that means, but essentially it’s not unknown, it’s probably more common than people think, where the publisher actually comes up with the idea for a concept or for series and they then go out and hire a writer to write it. So in terms of everything else, it’s exactly the same way as writing any other book. They gave me the basic setting in the basic characters and the very initial outline for the initial book then I made it my own. The only difference between that and the way any other publishing contracts are handled is that they own the copyright for it. So theoretically, if they wanted to, they could hire someone else to write it and she would call herself Eva Gates. VD: And people may not know, but the most famous example of that is Carolyn Keene who wrote the Nancy Drew series and Franklin W. Dixon, I think, who wrote the Hardy Boys. There were a whole series of people who wrote under those names. LB: Yes. I remember being very confused at the child when Franklin W. Dixon forgot the name of some of his characters. LB: That is so fun. Did you find that relaxing, to be able to just be someone else? VD: no, not really. Because I never pretended. Everybody knew, it was no secret. It even says right on the book, Eva Gates is also Vicki Delany. Maybe, I found a little confusing. When we go on, we’ll talk about a new project that I have, but I’ve decided to stick with my own name of Vicki Delany because the pseudonym is just a little, it is a little awkward. It’s a little confusing sometimes, like what do people call you at conferences and all that sort of thing. LB: So if this wasn’t tall enough, you also write in a genre that I did not know existed until I started researching you. You write books for reluctant readers. VD: Yes, that’s right. It’s a different kettle of fish altogether. It’s a wonderful project and it’s a wonderful idea. It’s a Canadian publisher by the name of Orca, and I do think there’s something similar going on in the U.S., who are mainly a children’s book publisher. And it’s a real niche that needed to be filled. Because adults that don’t read particularly well, that have low literacy skills or certainly that are struggling with English as a second language are embarrassed to be seen reading children’s books. So in a lot of cases, they tend not to read. So Orca came up with this line of what they call “rapid reads,” which are just that. Several different writers writing short but fast-paced, interesting fiction, adult language, adult themes, adult covers. Just short and plainly written. LB: What a terrific idea. LB: Are you moving more into cozies as a genre out of preference for the genre? VD: Yes, actually, I am. I’m finding that I’m really liking writing the cozies. Having more fun with it than I think I did have for a long time. And maybe it’s because I’ve had enough of human angst and tragedy and that sort of thing. And in a cozy of course, there’s a murder, there’s people that have to deal with it, but there’s not the sort of level of human tragedy and angst that there are in the police procedural series or in the stand alones. And in fact the darkest in terms of mood of all my books are the reluctant reader ones. VD: But even in the Molly Smith series, there are some dark things that happened to her and to some of the characters. Some just really, really enjoying writing the cozies now. LB: Well, okay, so the first cozy I want to talk about is the Year-Round Christmas Mysteries. LB: They’re charming and I love the Christmas theme, I am so all over the Christmas theme. Your first book in that series was, Rest Ye Murdered Gentlemen. And that did actually take place at Christmas time. VD: Yes it did. A couple of weeks before. The opening scene is at the Santa Claus Parade in Rudolph, New York, which wants to be known as America’s Christmas Town. LB: I will call it that. 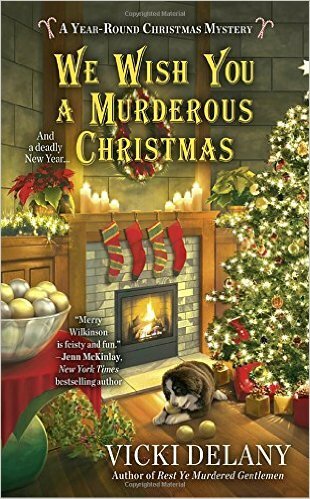 LB: So, the second book in the series is We Wish You a Murderous Christmas. LB: That is launching the day that this interview goes live. LB: Now, are launch days still exciting for you? VD: Oh, they still are, believe it or not. All the books that I have, I think I have 23, 24 published books now. And it’s still an exciting thing, it’s still an exciting day when I get my author copies in the mail from the publisher. LB: So, let’s assume that someone hasn’t yet picked up the Year-Round Christmas Mystery series. What should they know? VD: What they should know first of all is that they are intended to be really light, they’re intended to be fun. They’re cozy in the true sense of the word, that it’s about a small group of friends in a community who, somebody dies tragically in their community and it’s up to the main character to solve the crime. In this case, not because the police are incompetent but one thing I like actually about the cozy series, and maybe in a way it ties into the Molly Smith series, is the idea once again that people who live in a small town often know things that they may not even think to tell the police. “Oh, yeah, so-and-so was enemies with so-and-so 30 years ago.” Well, they may not even think to tell the police that but they might mention it over coffee with their daughter or something. You know what I mean? So, anyway, in the Year-Round Christmas series, the main character is named Merry, M-E-R-R-Y, Wilkinson and she owns a little shop called Mrs. Claus’ Treasures, which sells Christmas decor and jewelry and linens and dishes in that sort of thing. Her father is Noel, who plays the town Santa Claus. And Rudolph calls itself America’s Christmas Town, so the — it is a fictional town by the way. But the premise is that it’s taken advantage of its name, Rudolph, and turned itself into trying to be a Christmas destination for people to come pretty much all over upstate New York and around that area, to shop and there’s always Christmas festivities going on. And the book opens at the Santa Claus Parade. Merry’s float is sabotaged, and the plot begins from there. So it’s all funny and it’s all a little bit silly, and I just hope that the readers really enjoy it. And I really tried to not mock anybody’s enjoyment of Christmas, because I love Christmas myself. So the fact that the people in the town of Rudolph seem to go little bit overboard, that’s all just part of fun. LB: Well, there are a lot of things I like about the book. One of them is, I really like that you are very careful with your police officer, not to make her foolish. But she’s an outsider, that’s what Merry has that she doesn’t have. VD: Right, and that, I think, is something that I was actually pretty conscious about. Because I write a police procedural series, but I don’t have any law enforcement background myself, so I have to talk a lot of police officers about it. And the ones that I’ve met, I’ve made friends and I respect them, so I don’t want to have a character who is a buffoon. But, simply because, as you’ve said, she’s an outsider so perhaps she doesn’t know quite what’s going on in the town as well as the locals do. LB: No, but she’s smart enough to know that she doesn’t. VD: Yes. And I hope there’s a little bit of conflict, too, because cops don’t like when the civilians suggest they’re not doing their job properly. But she manages to keep a lid on that. LB: No, she does. And she, I think she uses — she’s perfectly happy to get what she needs from Merry. LB: She just doesn’t want her running into danger, which I completely understand. LB: The other thing that really liked about this series was how — and this is going to sound a little weird — but how respectful you are of Merry’s parents. I think there are so many series that set up a bad relationship between parents and children. You can understand how they might still get on each other’s nerves a little bit, but there’s a real love there, there’s a real affection. LB: Well, except for him. VD: Yeah, except for him. And whoever wanted to see him done in. So her father’s the town Santa Claus, and then I wanted to have a little bit of fun with the mother, so I made the mother a professional opera singer so she’s, she can be a little bit over the top sometimes, if you know what I mean. LB: So now, the second one, We Wish You a Murderous Christmas, what can you tell me about it? VD: It takes place just a week after the first one. And the reason for that is, even though it’s called the Year Round Christmas Mysteries, I wasn’t finished with her puppy. She has a fairly new St. Bernard puppy. St. Bernard was done purposefully, she owns a china shop and she has St. Bernard. Can you say bull in a china shop? He was still a puppy. So I felt if I moved the book on a couple of months, he wouldn’t be a puppy anymore. So I wanted one more book with Mattie — Matterhorn is his name and she calls him Mattie — so I wanted one more book where he’s still a puppy. And in this case, the tagline is something about, is there a Grinch in Christmas town? Because the owner of the Yuletide Inn, one of Rudolph’s premier destinations, has a heart attack and his son arrives to take over the business and the son appears to have plans that would ruin the Christmas spirit in Rudolph. So someone decides to take matters into their own hands. LB: And the other thing that cozies have and that you do very well is they generally have a little light romance going on. LB: And you give her not one, but two potential beaux. VD: Two potential beaux. I don’t want to go overboard with the triangle because some readers have said to me that they don’t like that too much. But I always think that’s a fun way to get things started, and it is somewhat of a fantasy in the series itself and there’s nothing wrong with having to charming gentlemen competing for your attentions. LB: That could be in my stocking any year. LB: So you are now going to launch another new series in the spring. LB: Now this one sounds delightful. It’s another cozy series and it’s got a Sherlock Holmes theme? VD: Yes, it does. And this one I’m actually really enjoying, as the writer. I’m loving it. And I do hope that people like it as well. It’s called the Sherlock Holmes Bookshop and Emporium series. And the main character is a woman by the name of Gemma Doyle who’s an Englishwoman and she’s come to take over the shop from her great uncle Arthur Doyle. It’s called Elementary, She Read. And it will be out on March 14th. And Gemma is, let’s say unusually perceptive. She’s also somewhat limited in the more formal matter of social skills. So it’s up to her friend Jane Wilson, who follows her around and tries to keep her from engaging in some sort of an excess. Definitely a little bit of conflict there with the police because I’ve created two police officers, one of whom is her old lover, back in town. And the other is a woman who absolutely does not trust Gemma one little bit. And her name by the way is Estrada. VD: Yeah, you get it? Detective Lestrade. So essentially Gemma Doyle is a Sherlock Holmes-like character, and that’s what I’ve enjoyed so much, writing about that, is trying to create this character that is in some way a modern, young woman version of Sherlock Holmes, in the way that she thinks, the way that she acts, the way that she reacts to other people in the way that they react to her. And all the humor that I hope that I can take out of that. So I’m enjoying this series a lot. LB: Now, is this where you wanted to, you were going to tell me a little bit about the idea of the pen name. Were you thinking of using a pen name for this series? VD: Yes. Yes it was that. Because it’s with a different publisher, it’s going with Crooked Lane, who is a new publisher that is really making a big splash on the scene. They’ve only been publishing now for little over a year, but the making quite a splash with some of their mystery books. So I’m really, really excited. Yes, so we did sort of toss around the idea of the pen name, but neither one of us wanted to pursue, between me and the publisher and my agent, neither one of its wanted to pursue it. LB: Fantastic, I can’t wait. VD: Can I invite people to look up my webpage? Which is VickiDelany.com. And I’m on Facebook and Twitter and all the usual sources. LB: Oh, that’s terrific. And I will also have all of those links in the show notes. Thank you so much for joining me today. VD: Well, thank you very, very much for talking to me. Any other time you’d like to speak to me, I’d be more than happy to.